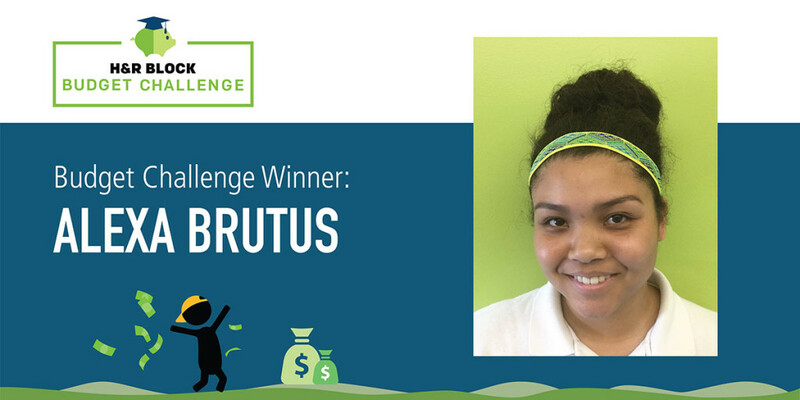 As a 14-year-old, Florida high school student Alexa Brutus is one of the youngest money masters to earn a $20,000 H&R Budget Challenge college scholarship so far! After a rocky start to the simulation, Alexa built a budget and stuck to it. That strategy paid off, and to her surprise, she was named a winner. We caught up with her to talk about applying the simulation skills to the real world and what if felt like to win. In your opinion, do you think learning about money is top priority for teens? I do, because there are a lot of financial things teens worry about, like getting a job, buying a car, getting into college and worrying about how much you’re going to take out in loans. Do you and your friends talk about money at all? What about your parents? My friends and I don’t really talk about money unless it’s about what they bought with their money. I don’t talk to my parents about money much either but they have always told me I should be saving my money early on, and I took their advice. Were you excited to participate in the Budget Challenge? Definitely! I thought it was a really cool idea and a fun thing to do. I’ve never been able to play a game as part of a class assignment. What were you interested in learning as part of the simulation? My goal for the Budget Challenge was to do well, not go into debt and pay all my bills. It was a little difficult to do at first, but as I progressed and I worked off a budget it got easier. Did you and your classmates work through the Budget Challenge together or was there some friendly competition? Kind of. My friends and I always tried to remind each other so that we’d all pay our bills on time. What was the most important lesson you learned from the simulation? I actually learned a little bit of everything. I learned how to pay my bills, what it would be like to have all those bills to pay in the real world and how to manage a credit card and pay it off on time. Do you think you have a leg up in the real world after taking the Budget Challenge? I feel like a lot of kids are just thrown into the real world and have a hard time managing their money. Now that I’ve taken the Budget Challenge, I know a little bit more about what to expect in real life with my finances — like what kinds of bills I’ll have, how to pay them, and why you should contribute to a 401(k). What was your reaction when you found out you won a scholarship? Halfway through the game I wasn’t doing really well and I was kind of surprised when I found out I won. I didn’t think I had a chance of winning because I was far behind in the beginning but as it progressed I kept moving up the ranks. I didn’t want to get my hopes up though. I had told my parents about the Budget Challenge, but I told them I wasn’t doing that well and was getting frustrated. What are your plans after high school and how has the scholarship changed those plans? I’ve been looking at Florida State University and the University of South Florida, but now I have more options and more colleges to choose from. Right now I’m not 100% sure where I want to go, but I might go into journalism. * Responses have been edited for clarity.